Habitat: Riparian. This wildflower grows in shady canyons and riparian woodlands in the desert and upland areas. Description: The flowers are in slender terminal racemes. 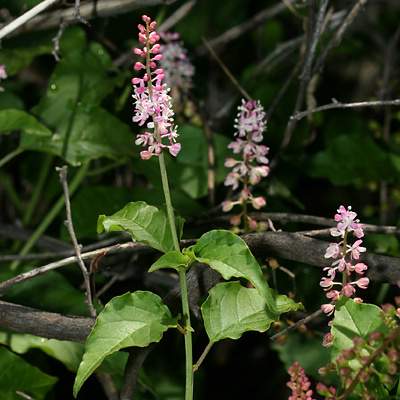 The individual flowers are small and have 4 rounded, pink, white, or green sepals. 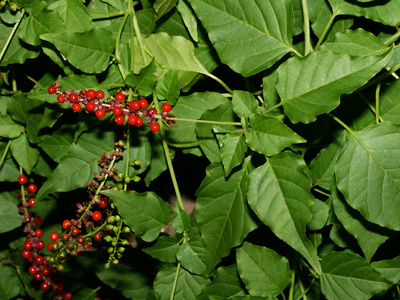 The round, red berries contain a red dye and are often present at the same time as the flowers. The leaves are green, petiolate, and ovate, lanceolate, or triangular in shape. The stems are slender. Poisonous – The entire plant is poisonous, especially the leaves. Although birds will eat the berries, they are also somewhat poisonous to humans.